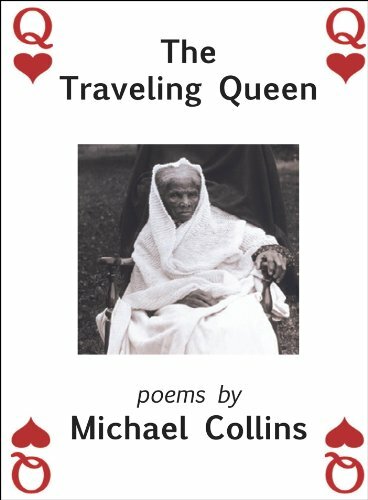 The Traveling Queen is a wildly rich and passionately far-reaching collection of poems about which it is almost impossible to make generalizations. One thing is clear—Michael Collins is a poet of obsessions. He is obsessed with history, obsessed with mythic women, obsessed with God. But most of all, Mr. Collins is obsessed with death. In the intervening poems, death flirts with queens, dances with history, and generally engages in a switching of cultural and intercultural adventures, speculations, realizations, frustrations, defeats, and triumphs. Mr. Collins’ considerable prosodic skill underscores his successful treatment of these themes. The wide, lingering lines in such poems as “Long Lines,” “Ise’s Story,” “Theme and Variations,” and many others impart a resonance, a stretch of experience, both real and imagined, congealed into emotion, into realities of the past and possibilities for the future. The symbolic queen who provides the book’s namesake appears and reappears in a variety of forms. She stands as metaphor at times and, at times, as savior. She is “Among the Queens of Exile,” a figure who “. . . must be consulted . . .” before “the/carrying out of the death sentence . . .” This is the “traveling queen” of “Theme and Variations,” where armies stand “. . . atop a pile of corpses and peer after her” as she goes. Mr. Collins is always looking at history. “The Scaffold” is a first person monologue—apology, actually—in the voice of the carpenter who built the scaffold for the execution of John Brown. “Versailles” is a stunningly well-handled sestina exploring the deadly ramifications of the treaty ending World War I. “To Pope Formosus” tracks the history of the ninth century pope who was removed from his sarcophagus to be tried as a dead man for crimes against the church. In every case, the poet stands by, as if eye witness to history. When this collection is read as a whole, the individual poems expand in scope, expand in time, the texts merging with one another into a kind of meta-text reaching across landscapes, oceans, seas, spanning the universals of our human passions and adventures. These poems move in and out of the bodies of gods, lightly touching the hem of death and life in such pieces as “The Savior,” which tracks a modern-day cult leader, and “Bill Burroughs in the Underworld,” in which Burroughs argues his fate with Christ, Osiris, and the Buddha. In “Empathy,” a young man is singled out for war and disfigurement, not by blind fate so much as by God, who “. . . sets his seal” on the man with a careless ray of red sunlight. Chance, fate, and early death—the lethal cocktail Mr. Collins shakes up in this collection intoxicates like illicit highballs at a dark service for the dead. In “History,” centuries are born along with kings and wine and war—always war, with its blood and death, its fires of destruction, “. . . the ash of temples sealed in a jar.” Death, in its silent eventuality, harvests even the gods in its crematory urn. In the six-part poem, “Notes on Longing,” Mr. Collins examines the past and the future. He muses on the pursuit of glory and on the concept of home. He speculates on the habits of the lonely dead while pondering doppelgangers and gravestones and coffins. Mr. Collins’ fierce imagery and intense grasp of history tend sometimes to overwhelm, concentrated as they are in these pages. The need for the reader occasionally to stand back and catch his or her breath is more than offset, however, by the emotional compression and insightfulness of this penetrating work. The Traveling Queen is a caravan of miracle and misfortune, martyrdom and worship, history, God and the death of God. It is a passionate book that reads our own humanity back to us in line after line of unflinching poetry.